Abstract: Multifunctional products have been developed to combine the benefits of functional components and terpinen-4-ol (TP) delivery systems. 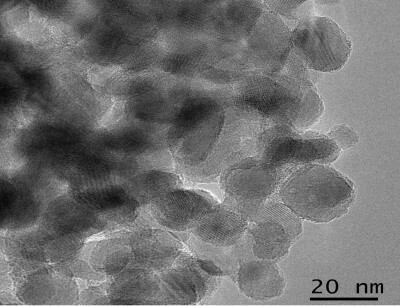 In this way, p-toluene sulfonic acid modified titanium dioxide (TiO2) nanoparticles and TP, an antioxidant, have been incorporated in liquid-crystalline formulations for photoprotection and controlled release of the TP, respectively. By X-ray powder diffraction and diffuse reflectance spectroscopy, we noted that using p-toluene sulfonic acid as a surface modifier made it possible to obtain smaller and more transparent TiO2 nanoparticles than those commercially available. The liquid-crystalline formulation containing the inorganic ultraviolet filter was classified as broad-spectrum performance by the absorbance spectroscopy measurements. The formulations containing modified TiO2 nanoparticles and TP were determined to be in the hexagonal phase by polarized light microscopy and small-angle X-ray scattering, which makes possible the controlled released of TP following zero-order kinetics. The developed formulations can control the release of TP. Constant concentrations of the substance have been released per time unit, and the modified TiO2 nanoparticles can act as a transparent inorganic sunscreen.